Traserbas is the top rated private transportation company in Switzerland, we started to provide Zurich airport transfer and Basel airport transfer and now we are able to offer affordable Zurich airport taxi, Basel airport taxi, private limo service and car service with 7 passenger van and minibuses for 8 people to and from the cities, cruise ports, hotels, airports simply to and from the whole Switzerland and the neighbouring countries. One step, just send us en email or call us and we will help you with all your private transportation needs. We guarantee fair prices and fair cancellation policy. The easiest thing is to book with us, doesn`t matter if you are travelling for leisure or business, if you are a travel agent or a personal assistent and you want to book for your boss. We keep all things very simple, no registration required, no long booking tools, Traserbas offers personel request and booking service. We accept payment by credit card, payment with cash or wire transfer. Call us now or send us a request with all your transportation needs. Best prices for all your transportation needs from 1- 8 people. Friendly drivers, impeccable and clean vehicles to and from airports, cruise ship terminals, hotels, train stations, ski resorts. You want the best value? Comfortable and clean vehicle? Just get in touch with us, with more than 50 bookings each day and best reviews on google TRASERBAS is the right company. Are you a travel agent or a personal assistant? Look no further, contact us right now. Our flat rates includes all taxes, fees and tolls. You can book your Zurich airport transfer right now using our form absolutely free with no upfront payment. Pay your driver only when you get here and trust that we’ll be there with the vehicle of your choice ready to take you to your next destination. We have vans, limos, SUVs, small cars, and so much more. If you’re ready to book your Zurich car with a driver to take you exactly where you need to go, fill out the form today and reserve your spot. Why a Car Service for Zurich Airport (ZRH) Transfer and Basel Airport (MLH, BSL, EAP)? There is so much to do and see in areas like Zurich, Basel, and other area of Switzerland. But before you can start your vacation or business meetings, you still have to travel here. That means hours and hours on planes and sitting in airports with pounds upon pounds of luggage. The last thing you want to do after all of that travel is worry about how you’re going to get to your next destination. Many people wait for Zurich airport taxi services, but those can take a long time, rarely have room for you and your stuff, frequently are old and uncomfortable, and often have grumpy drivers. Be there when you arrive. Help you with your baggage. Take you anywhere you need to be. Transfers to Basel Cruise Port. Day trips from Basel and Zurich to Germany, Italy, France. Private 4×4 (4WD, all wheel drive) cars to ski resorts in Switzerland and the Alps, and so much more. We provide airport taxi services, but we do so with an endlessly customizable ride to make sure that your entire experience is as pleasant as possible. Because we can take you anywhere you need to be, we can stop off somewhere for food, wait for you at your hotel, drop you off at multiple hotels (for when you’re traveling in group) and so much more – all for one affordable price. 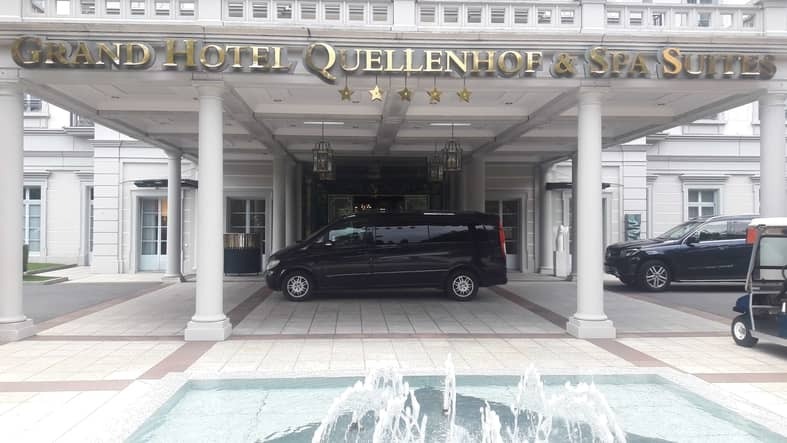 One of the main reasons that so many people elect to use us for their private transfers to and from Zurich Airport and Basel airport is because we have a full fleet of vehicles capable of handling any size group and any amount of luggage. TRASERBAS Zurich airport transfer and Basel airport transfer is different. These are limousine quality vehicles at taxi prices, giving you a luxury experience without hurting your budget. But most importantly, they are the size that is right for you and your luggage. Whether you’re traveling by yourself, with your family, or with a large group, we will have a vehicle that can fit all of you thus saving you time and energy. Any of the many hotels in the area. We’re faster and much more private than a shuttle. Basel Rhine River Cruise Port, from the dock to the pier to the terminal. Any of the many ski resorts, including Bern, Zermatt, Grindelwald, or Gstaad. Our of the country – if you need to go to France, Germany, Italy, we’ll get you there. Many people consider car rentals in Zurich, but that’s not always a good idea. Most vehicles are extremely expensive here, running several hundred dollars a day. You also are not allowed to leave the country, and you have to be used to the drivers in Switzerland – which may not drive the same way as your hometown. We’re the top rated private Basel and Zurich Airport car service, which means that you can also hire us for other services as well. For example, if you want take a day trip anywhere out of the country or on a long drive, we can take you there in a way that taxis and car rentals cannot, not only transfers to or from Zurich airporz and Basel airport. Our car service in Basel and Zurich is here for you, with the luxury experience that you hope to enjoy when you visit the Switzerland area. Very few other private car services in Switzerland are able to provide that type of airport transfer services, giving you the ability to reach any destination from Zurich airport or Basel airport with limited stress. Because we offer minibuses and vans all of which are luxury in style, you and any size party can sit back, relax, and enjoy the ride as we bring you to your next destination. No Upfront Costs – Never pay for your ride upfront so that you always know that we’ll be there to take care of you. No Cancellation or Change Fees – Need to cancel or change your booking? No problem. Just let us know and we’ll change our schedules right away. The BEST Drivers – Our chauffeur service truly cares about your satisfaction, and will either help answer any questions you may have or leave you alone if you want to relax. Plenty of Luxury Space – With a full fleet of luxury vehicles and ample room for luggage, you’ll never feel cramped or uncomfortable like you might on other taxis. Long Distance Travel – We’ll go anywhere you need us to, no matter how far or how long it will take. We can also stop off at any time and change the trip if you need additional driving help. Don’t believe us? Over the past few years, we have gone to the following ski resorts: Grindelwald, Gstaad, Zermatt, Bad Ragaz, Engelberg, Titlis, Jungfraujoch, Lauterbrunnen, Davos, Laax, Wengen, Saas Fee, Klosters, Nendaz, Adelboden, Andermatt, Champery, Lenzerheide, Leysin, Verbier, Arosa, Flims, Veysonnaz, Savognin, Villar-sur-Ollon, Zinal, LeukerbadLes Diablerets, Montana, Beckenried, Saanen, Interlaken, Bettmeralp, St. Moritz. And that’s JUST the ski resorts that we’ve taken our riders to. That doesn’t include all of the hotels, restaurants, landmarks, convention centers, and so much more. TRASERBAS truly believes that transportation is a critical component to an enjoyable vacation or business travel, and that is why our luxury car service and limousine rentals are here to make your Zurich Airport, Basel Airport, or other taxi destination needs are met. Fill out the form on our website, and our team will be there to assist you with your transportation needs the moment you arrive. Let TRASERBAS be your top choice for Basel and Zurich airport transfers.